The thyroid gland starts developing on approximately the 24th day of gestation. The gland starts as a thickening of endodermal cells lying in the midline of the floor of the pharynx, between the first and second pharyngeal pouches. The thickening of the endodermal cells grows to form the median diverticulum which appears caudal to the median tongue bud in the fourth week. It then grows as tubular duct, the tip of which bifurcates and the tissue mass grows. From this the isthmus and the lateral lobes of the gland develop. Then it migrates down to the neck. By the seventh week it reaches the final position in relation to the larynx and the trachea. The median diverticulum is connected to the pharynx by the thyroglossal duct, and the site of connection makes a foramen in the adult tongue called the foramen caecum. The distal part of the duct may develop to form the pyramidal lobe of the thyroid gland. 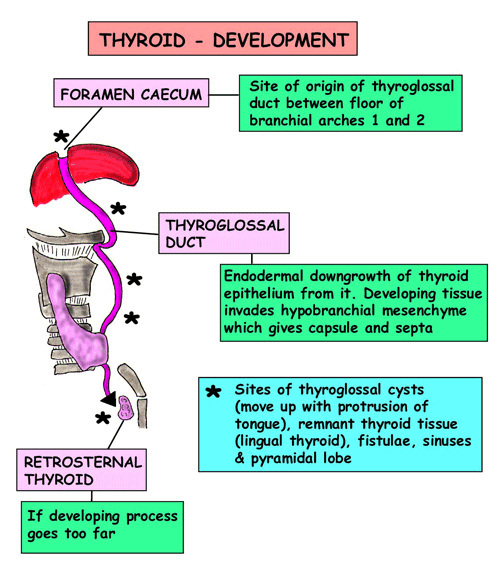 The thyroid gland may develop in any part at the midline of the thyroglossal duct and results in lingual, suprahyoid, retrohyoid, or infrahyoid positions. The thyroid gland is large in newborn babies, with a long narrow isthmus connecting the two lobes and becoming half of the adult gland size at 2 years of age. 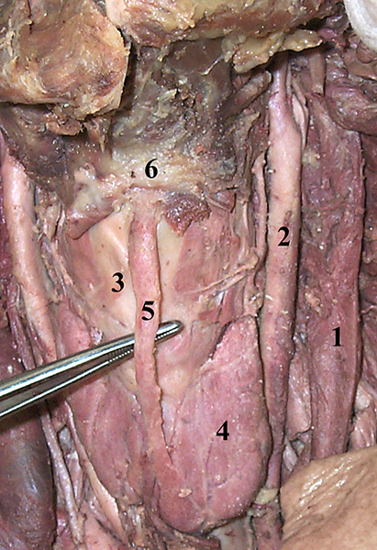 (4) Left lobe of the thyroid gland, (5) Thyroglossal duct, (6) Hyoid bone. The parathyroid glands develop from the endoderm cells between the third and fourth pharyngeal pouch. The inferior parathyroid glands develop from the dorsal aspect of the third pharyngeal pouch, and because they travel far in foetal life, they may have a wide range of distribution in an adult. In contrast, the superior parathyroid glands develop from the dorsal recess of the fourth pharyngeal pouch. They remain superior to the thyroid lobes. The parathyroid glands have a different size and position in neonates than in adults, and the size is double between birth and puberty. The parathyroid hormone is produced from the 12th week of development onwards. 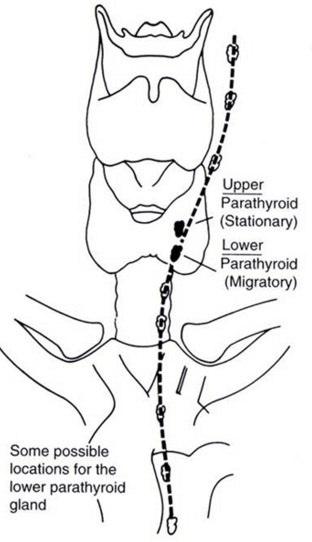 Pathway taken by the lower parathyroid gland and its possible position in the adult.